It’s amazing how the pursuit of a specific activity can fully engulf our lives, whether that be backcountry skiing, ice climbing, or for me, hunting elk. My first memory of a bull elk was while riding in the back of my dad’s truck on an old dirt road in the mountains of Montana. It was last light, and the sky was ominous with thunder rumbling above. Suddenly sparks flew from the side of the road, and my dad hit the brakes. Two bull elk jumped the barbed wire fence, busted the top wire, and ran right in front of the truck. Their massive antlers vanishing into the darkness was haunting to me as an 8-year-old, but in that fear was also a sense of intrigue. Since that day, my love for elk has grown exponentially. What first started as a flash in the darkness has resulted in a 365 pursuit of knowledge. 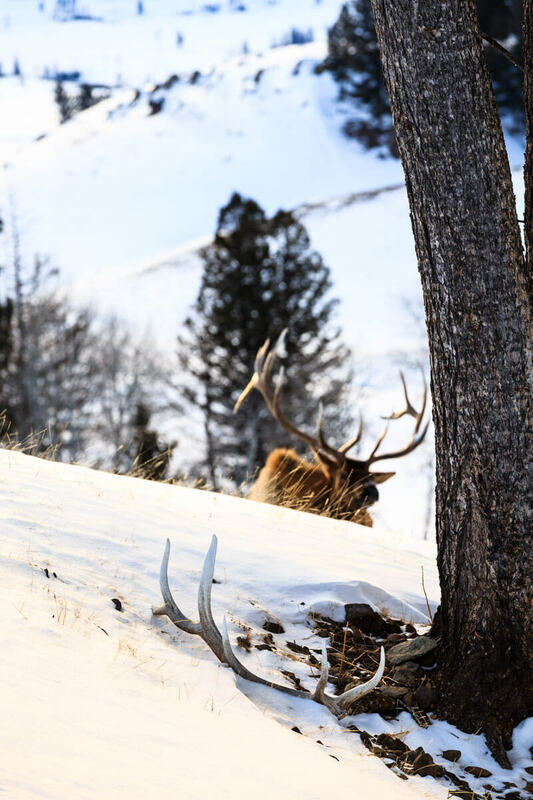 In the summer I set trail cameras and glass from high mountain ridges scouting for elk, learning their summer ranges and finding bachelor groups of bulls. Then, come fall, it’s bow/rifle in hand. Then, come winter, whether successful or not that fall, I’m scouting for bulls and watching where they show up after months of hunting pressure. Then come spring the hunt is brought full circle as I search for shed antlers. 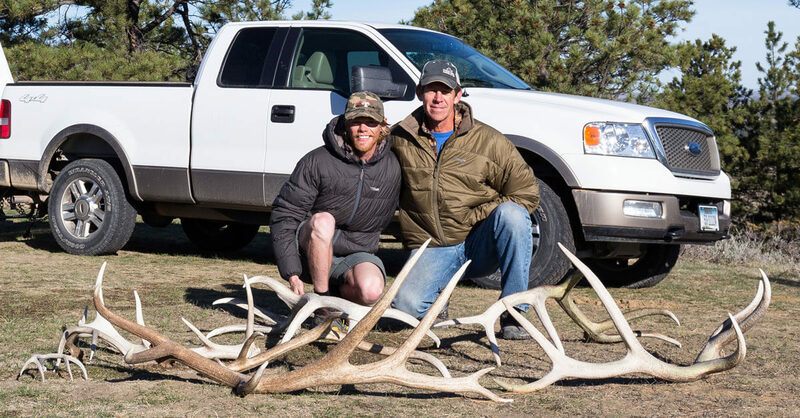 Shed hunting has become the biggest source of knowledge for my hunting partners and me. Shed hunting in the spring equates to 15+ hour days pounding the mountains, learning winter ranges, finding past year’s rut sign, and if we’re lucky finding shed antlers. The sweat and fatigue are like no other hunting we’ve done. From sunup to sundown we hike and constantly build out knowledge base of elk and their habits. 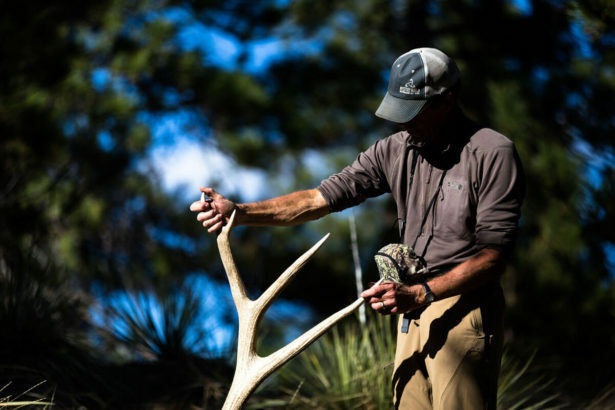 Through finding sheds we can decipher the type of bulls or bucks that live in an area, and potentially discover animals that we never knew existed, that, despite intense hunting pressure, have remained ghosts to all human eyes. Shed hunting isn’t just about finding sheds, it’s about the continuation of hunting season. It’s about always learning. Honing our skills in the mountains. Honing our confidence and building our love for an animal that encompasses our lives. Shed hunting brings hunting 360. Bio: Steven Drake is a hunter and hunting photographer based out of Bozeman, Montana. His focus is on telling the stories of those who go off the grid to pursue animals in ways that few have ever done, elevating the sport to new heights that garners support and understanding from all adventure enthusiasts. To him hunting is more than just a trophy photo, it’s every element of the hunt from travel, preparation, weather and animals to the wild places hunting takes us and the lifelong friendships that are forged from hunting. His work encompasses all these aspects. Through documenting his own hunts and others, Steven has paved a career in the industry and is at the forefront of the creative hunting movement that is aiding in the universal acceptance and understanding of the sport.